Asphalt shingles used to owe their popularity to their affordability alone — and perhaps the limited options at the time. Thanks to several innovations over the decades, their current iterations are significantly more durable compared to their older versions. However, this doesn’t change the fact that they can weather more quickly than other roofing materials. Understanding what affects your roof can help you take care of it. Any roofing and siding contractor will say that exposure to UV radiation affects the rate of asphalt-shingle degradation. This invisible light from the sun alters the chemical makeup of the material, accelerating its breakdown. South-facing asphalt-shingle roof slopes with flatter pitches tend to suffer more. High temperature increases the rate of asphalt-shingle deterioration. Its main source is the sun, of course, but it could also come from below. A poorly ventilated attic traps the warm air rising from the living spaces, setting the stage for heat buildup. When left unchecked, the constant level of high temperature can fry the underside of shingles, causing them to curl prematurely. Water is bad to a long list of construction elements and asphalt shingles are no exception. Any experienced provider of roofing services will agree that it encourages blue-green algae and moss growth. The moisture-ridden warm air from an inadequately ventilated attic can also cause blisters, which will dislodge the protective granules of shingles when they pop. In turn, the affected pieces become more vulnerable to the effects of UV radiation. Further, ice damming increases the chances of moisture damage to asphalt-shingle roofs. This could be avoided with proper attic ventilation. Without enhanced properties, high-velocity hailstones can crack asphalt shingles on the front or back upon impact. When they fracture, they can become less effective as a roof covering. Asphalt-shingle and metal roofing specialists warn that strong winds are destructive in many ways. They can blow shingles off, make overhanging branches brush against the granules and leave abrasion with flying debris. Without the aid of extra nails and starter strip shingles, they become more prone to wind uplift and moisture penetration. No roof is totally immune to weather, but a credentialed roofer knows what it takes to make asphalt shingles last for as long as possible. 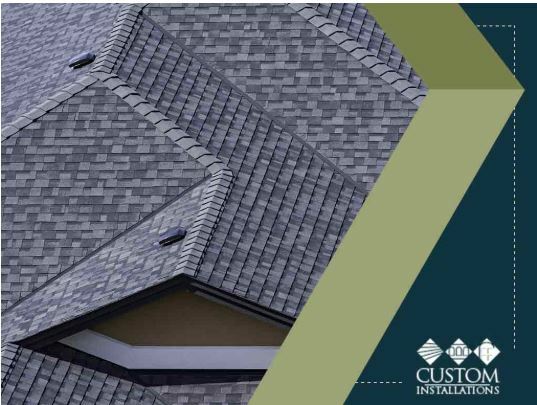 Call Custom Installations at (847) 979-5522 to learn about our high-quality asphalt-shingle products and get a free estimate. We serve homeowners in Highland Park, IL, and the surrounding communities.